Quality Control | Quad Infotech Inc. Coordination between the QC and Production teams have always been a big challenge in steel mills. QMOS has resolved this problem by fully integrating all QC related functions into its core architecture. This allows all QC related information and actions to be readily available across the enterprise in real time. This creates an unmatched level of communication and awareness between the QC and Production departments. QMOS QC Operational screens are seamlessly integrated to receive test results from a wide range of test equipment including spectrometers, Leco machines, Jominy equipment, tensile machines, microcleanliness equipment and more. QMOS automatically dispositions material based on active test results that are received, preventing material that does not meet tolerances to be placed on hold for the respective failure. Material can be retested, force passed, reworked or downgraded with ease. Furthermore, quality checks in QMOS are put in place to withhold shipments if material has not been fully tested. During rolling campaigns, the ability to record and graphically visualize dimensional test results provides operators with warnings of material size creeps, and enables them to quickly adjust roll gaps to be in tolerance. All tests and visual inspections are easily entered in QMOS with a complete history of date, time, and the information of the person who recorded or modified any test results. End to end test result visibility helps significantly in identifying expected mechanical test results of heats with questionable chemistry. Having instant access to data on past performance of heats with similar chemistry makes decision making of what to roll the heat against simple. Through its integrated quality control functions, QMOS offers various methodologies of dynamic spec calculation designed to reduce the consumption of alloys and additives. Customers utilize dynamic spec ranges based on intended size and grade of the finished good material to resolve melt specs. One of these methods is called floating aims, where no specific chemistry specs exist. 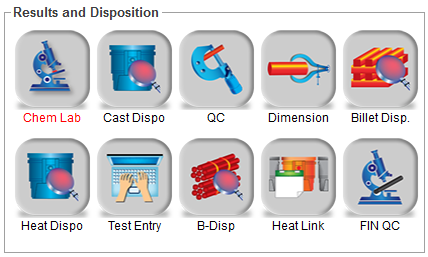 For each heat, QMOS calculates the spec requirements based on a set of reference elements, the floating residual chemistry results taken at the furnace, intended size, and grade. Chemistry specs can be updated on the fly to meet the mechanical requirements while minimizing alloy consumption and cost. Safeguards have also been placed to prevent orders without appropriate specs from being put on the schedule and appropriate visual indications are provided to the users. End to end heat genealogy tool in QMOS MI combines process recipes with process parameters, test results and operator steps for any given heat to paint a full picture of what happened during production. This unique tool has revolutionized failure analysis studies in case of claims. The QMOS advanced quality management tools allow users to do various post mortem analysis on past production data and use it for predictive models to evaluate potential tensile properties based on chemical composition. This along with a wide range of visual quality tools pave the way to analyze quality data in a way that was not possible or very difficult to do in the past. Advanced QC analysis gives the quality engineers the power to visualize the quality behavior of the chemistry results and their impact on physical and mechanical test results for a given size range. At the same time, the quality engineers can assess the efficiency of the productions recipes and work towards more efficient and cost effective ones. QMOS is fully integrated with ERPs available in the market. 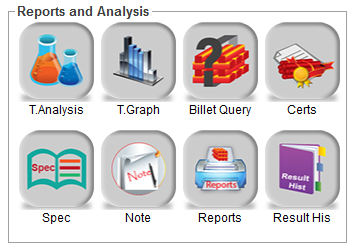 All test results and material dispositions are sent to the ERP, allowing certs to be easily generated. Internal plant tolerances can be contrasted with the global grade tolerances in QMOS to have further process control at the plant level and control cost.